“Text with traits” is now supported, that means your can add color, change font and text size for each key. However, you still cannot use key with image. Easier way to get UIView hierarchy. Before I documented how you can obtain the UIView hierarchy in syslog. It uses custom function, but there is are 2 built-in way to get this. When the dump is completed, a Darwin notification "com.apple.UIHierarchyDump.finished" will be posted. Here, "event" is a GSEvent converted to a plist using GSEventCreatePlistRepresentation(). You can add the event to an array and save that array for later reference, e.g. The higher the playback rate, the faster the system will run the events. the "detail" argument contains exactly 1 key, "UIApplicationEventRecordingDeliveryTimeUserInfoKey", which points to an array of the time the corresponding event happened. Decompressing .zip files with iWorkImport.framework. .zip files need to be supported in lots of places on the iPhoneOS. .ipa are zip files, .docx are zip files, .key are zip files. Unfortunately there is no centralized framework or library to handle these zip files. In fact, all Bom.framework, OfficeImport.framework and iWorkImport.framework have their own, private implementation to decompress a .zip file. Out of the three, iWorkImport.framework is the friendliest. 1. How to create that red delete button? Normally list controllers inherit from the PSListController, but you can make a class inherit from PSEditableListController so that it becomes... editable! Actually, more like deletable. There will be an extra Edit/Done button on the top right hand corner, pressing it will reveal the deletion control. If you actually delete a cell, the corresponding specifier's deletionAction will be called. iKeyEx 0.1-99f Released, now supports .cin IME. Changelog: There were 3 versions in between, "d" was mainly to fix issue 1, "e" was an emergency release to fix a crashing bug on the preferences, and "f" fixes rest of the bugs and improves performance of characters tables. Fixed issue 1. .cin input manager can be used natively with iKeyEx. Fixed a bug that causes crash when a layout.plist using text with traits is encountered. Thanks DB42 (of OpenHebrew) for reporting! Basic localization (en, es, zh_TW, zh_CN). Fixed a bug that may cause preferences to crash. Thanks @mikitomo for reporting! Loading characters table is now much faster (from O(n) to O(1)), that the second time you use a .cin input method will load instantly, instead of need to wait for 1 ~ 3 seconds (at a price of ~200 KiB disk space). Name for layout.plist keyboard cache are now correctly generated. Thanks DB42 for reporting! Keyboard list will be properly updated after Mix and match. The counter in "Delete cache" will be properly updated after a cache entry is removed. Candidate list computation won't lock up the application forever (at worst case) anymore. Support for layout.plist on non-default keyboard type is fixed. Thanks DB42 for reporting! Actually issue 1 was a major reason why the iKeyEx project exists, and now it is finally implemented. The .cin input method is mainly for use in table-based Chinese input method, but it can be used to implement that things too, e.g. the MultiTap method + Text prediction can be made on top of a .cin IME. The technical detail of .cin files and the technology around it can be found here. Embedding a preference bundle, in your app. If you want to use Preferences.framework in your app, you can do it like this. Why do this? One major reason it that we can now debug the Pref Bundle in Simulator, and speed up development. Fixed a silly bug causing autocorrection not working for internal input modes. nlist nows checks for N_ARM_THUMB_DEF just for safety. Probably make it works for 3GS, probably not. Input modes won't suddenly "reset" now. QuickScroll 0.1-12d (@r437) fixed a bug where you could scroll horizontally (and actually, vertically too) one pixel too far. Also, it now synchronizes when content size change (e.g. additional content of a web page is loaded, or orientation is changed). Can scroll to the top in MobileNotes now. Now the triple tap will iterate all touches, eliminating any possibility that a triple tap (that ought to be caught) is missed. QuickScroll will be suppressed on non-scrollable views. 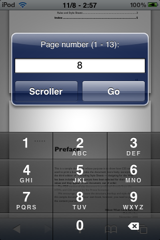 QuickScroll (PDF paging) will be suppressed on PDF files with 0 pages (usually those incomplete files). 0.1-12c was submitted to BigBoss, so it should appear in a few days. Those who can't wait can download from here. Meanwhile I want to explain one decision. Why triple tap? My initial intension was three-finger touch, but I sometimes hold the device with one hand and the other occupied, so any multitouch ideas are ruled out. But how about, like, triple-tapping the home button? 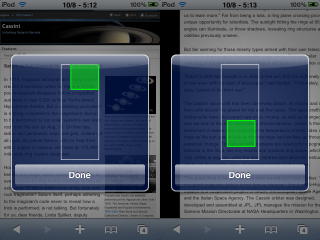 This won't work either, as it is possible that two web views appear on screen simultaneously. This excluded all solutions not using the screen, e.g. using the home/lock buttons, shaking the device, etc. If you have installed iKeyEx 0.1-99b (make sure you're using 0.1-99b) and experienced Crash and not using 3GS please email me kennytm@gmail.com, preferably with a crash log (and syslog if possible). Download is here, as usual. 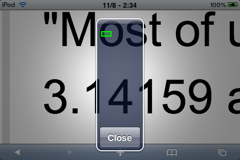 The seventy people who have installed 0.1-12a should also upgrade for a correct offset calculation in MobileSafari. Now QuickScroll becomes a 1.5-day project, so there are much more features introduced. Jump to any page in a PDF file. 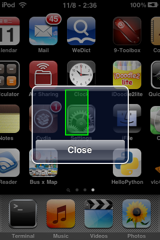 Fixed from 0.1-12: Rotating from portrait to landscape position no longer makes the "Close" button unreachable. Modified: The alert box is now smaller. Language support for English, Spanish, Italian (thanks Sagitt for a few translations) and Chinese (T+S). This version should be stable enough and I think no more features are needed (besides more localizations). The very same package shall appear in Cydia repo soon if I receive no bug reports by tomorrow (14:00 at GMT+8). P.S. The dylib is exactly 20,000 bytes. QuickScroll 0.1-12 is released. It's a quick (:p) project done within half a day. In a long web page, triple tap on anywhere (hold one finger and triple tap the other to avoid resizing). A dialog will appear. Drag the green box to scroll around. iKeyEx 0.1-99b is released. This is a beta version, and the release version will use the version number "0.2". Compared with the iKeyEx 2.x series, a lot of things are changed that may render an existing keyboard useless. Firstly, text with traits are not supported yet, meaning keyboard that entirely relying on it such as 1Click@Thai (com.iclick.thai5rowkeyboard) will entirely unusable in this version. Secondly, libiKeyEx.dylib is rewritten and uses a different API. That means existing keyboard more complex than a standard keyboard, including ℏClipboard and 5 Row QWERTY cannot run. If dependence is not a lot, however, transition to 3.x is pretty easy. Thirdly, the input mode architecture is changed. Previously, an input mode linked to exactly one layout. It is decoupled on 0.1-99b. For example, I can have a 5-row QWERTY keyboard for English, for Japanese and for Chinese simultaneously. You can do it in the Mix & Match options in Settings → iKeyEx. But because a layout no longer completely defines an input mode, installing a keyboard may not be immediately usable. Example 1: The Deutsch 5 Row Keyboard (com.ipuhelin.keyboards-5rowdeutsch) will be installed using English (US) as input manager. You can fix it by choosing Settings → iKeyEx → Mix and Match → 5RowDeutsch → Input manager → German (Germany). then "Create", to create a new input mode. and change it to "5-Row DVORAK" at the top. and give it a name. It must not be empty. Finally, go back to the iKeyEx screen and tap "Keyboard"
You should be able to see the new input mode. Tap on (+) to add it. I haven't put in any localization yet. They will appear in the next version. We've been long told that there're only 7 types of property list objects: CFString, CFNumber, CFBoolean, CFDate, CFData, CFArray, and CFDictionary. These are the only types that can be encoded into a property list without conversion. At least it's what on the surface. There's in fact an eighth type of property list object, called _CFKeyedArchiverUID, to support the NSKeyed[Un]Archiver. An archived data is actually a binary property list. The encoded objects are laid out linearly, and each object has a UID numbered serially. Objects can be linked to each other, forming an "Object Graph". The links are encoded as _CFKeyedArchiverUIDs. A _CFKeyedArchiverUID is essentially a 32-bit integer. Why isn't a CFNumber be used? Because it would then be impossible to distinguish between a regular number and a link. Becuase _CFKeyedArchiverUID is not publicly documented (you can find its trace in the CF source code), it is a perfect type to conceal these supposed-to-be internal information. But it introduce problems when handling with plist files that have a _CFKeyedArchiverUID. Firstly, Apple's Property List Editor does not recognize them. And even worse, these UIDs are stripped when saved. You can try this: open any .nib file, without any modification save it as another file. You'll find that the new file becomes smaller. Also, _CFKeyedArchiverUID does not have a specialized -description method. When you NSLog a dictionary containing with object, a <NSCFType: 0xpointer> will be displayed (although CFShow does show the content). This means any dictionaries containing a single entry with key CF$UID and an integer value will be converted to a _CFKeyedArchiverUID. One day after I found no useful info on LC_DYLD_INFO_ONLY, there's already a paste showing the answer (this is Google cache, the original one is already invalidated). I have copied it to pastie in case the Google cache is removed. From the comment we clearly see the intent, and hints to how to decode this command. AppSupport.framework contains a class called CPRegularExpression, which performs regular expression matching. Here is an interface and some sample code. However, I strongly recommend against using this class. Why? Because the backend of CPRegularExpression is in fact regexec. regexec is underpowered and not fast at all (for commonly encountered regexes, at least). Combined with the dynamic nature of Objective-C it means very slow (you can get an IMP to speed this up though). Instead, you should use the more powerful and faster PCRE (it's of course hard to use, but there're plenty of wrappers). Won't crash on 3.1 binaries now, but external class info is absent. 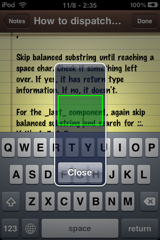 For example, for SpringBoard, SBAppWindow : UIView will be shown as SBAppWindow : XXUnknownSuperclass. Private ivar detection. From whether the ivar symbol is exported we can guess if that ivar is @private/@package or @protected/@public. class-dump-z 0.1-11s now recognizes this piece of information. -h super now works even the method includes non-id/void/SEL types. Argument reordering now works on Linux (again). Technical detail on why class-dump-z 0.1-11r crash with 3.1 SpringBoard, and why the external class info cannot be extracted in 0.1-11s. The superclass pointer is NULL. Which is fine, as such already happens before 3.1. But how can the system know the superclass if the pointer is NULL? Before 3.1, this location is in fact referenced by an entry in the relocation table. At runtime, the dynamic linker will replace data referenced in the relocation table by the real address. Because of this, class-dump-z 0.1-11r cannot resolve what that address will be, and returns NULL. The code afterward see this NULL unexpected and result in exception. 0.1-11s now checks for this failure, but it's just a bad workaround. Because every externally referred class, like NSObject, UIView, etc. will become XXUnknownSuperclass. It is run without the 3.1 SDK. Because this is an unknown command, nm totally fails on the 3.1 SpringBoard. This load command is not documented on Apple's site either, and google yields no useful result at all. But we can find the string _OBJC_CLASS_$_UIWindow at 0x106ea0 inside the so called "bind" table, so definitely something important can be found here. 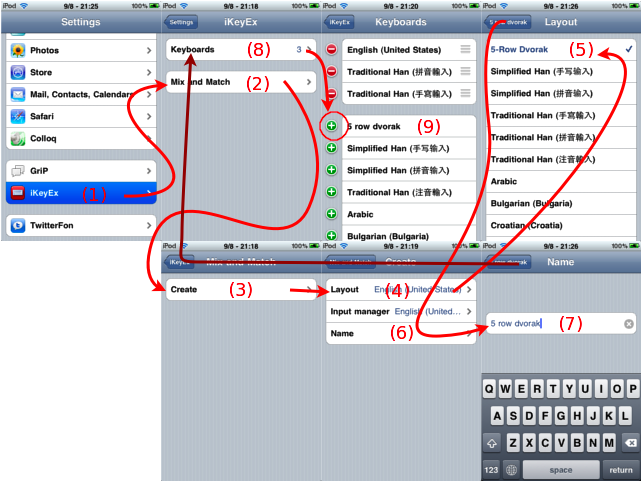 The layout.plist to UIKBKeyboard conversion function is done. As promised, an executable that converts layout.plist to .keyboard files can be downloaded from here. Check that there are 8 .keyboard files in the directory. Now all QWERTY keyboards are replaced by Colemak. If you don't want to replace the QWERTY keyboard, you can rename them to something else. Say, you'll never use the Thai keyboard, then name them iPhone-Portrait-Thai.keyboard, etc. Now you can activate the Thai keyboard to use the custom one. This solution is not a replacement of a full iKeyEx. For example, 5-Row QWERTY won't work completely because the custom-code injecting part is not done yet (but Punctuation Mod should work). hClipboard won't work at all since it's no a layout.plist. Other caveats are listed here. Please don't host Cydia packages publicly that uses this solution, because every keyboard will become mutually exclusive now :) Only for personal use. Adds a Windows x86 version. Arguments can be placed arbitrarily (e.g. class-dump-z UIKit -a -A now works). If you have installed the iPhone SDK, the -y switch is no longer necessary when using -h super. Also, using -h super won't crash now. As titled. If you are experience crashes when new mails arrive to an Exchange mail account, please upgrade to GriP 0.1-11r. Detail can be found in issue 242.